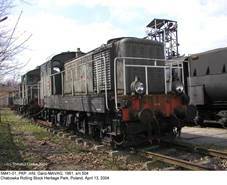 SM40-01 (MÁVAG 94/1958), preserved at Chabówka railway stock heritage park; photo taken on April 13, 2004. Another picture of this locomotive, taken on May 6, 2017. SM40-06 somewhere in Poland, 1961. Photo from my collection. Side drawing of SM40 by M.Ćwikła (SK vol.3/1996). 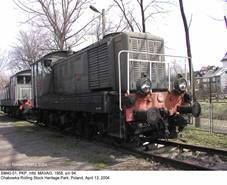 SM41-01 (Ganz-MÁVAG 504/1961), photographed at Chabówka railway stock heritage park on April 13, 2004. 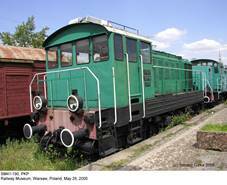 SM41-190 (Ganz- MÁVAG 986/1966), Railway Museum, Warsaw; photo taken on May 25, 2005. 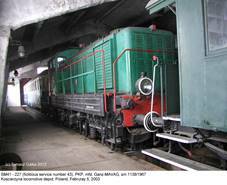 This SM41-227 (Ganz- MÁVAG 1138/1967), with fictitious designation SM41-43, is preserved at the Kościerzyna depot; photo taken on February 5, 2003. 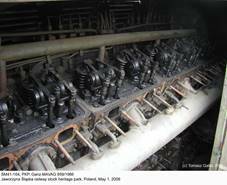 … and close-up of its Ganz-Jendrassik diesel engine, albeit incomplete (May 1, 2006). 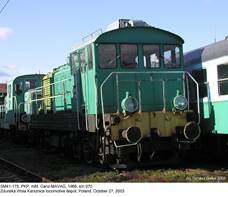 Unidentified SM41, photographed in Jaworzyna Śląska on October 28, 2005. Side drawing of the BDŽ class 51 from LBDZ; Polish SM41s were almost identical, apart from upper headlights. SM41-42, location unknown, 1960. Photo from my collection. SM41-175 with two other diesels in the background (SM30-039 and SM03-41). Location unknown, August 28, 1997. Photo by Rafał Roskosz (from my collection). 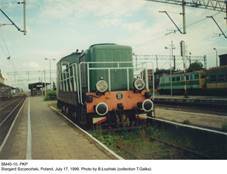 SM41-226, the last one in service, photographed in Grudziądz in August 1998. Photo by Rafał Roskosz (from my collection). 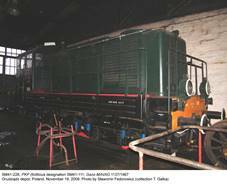 Another picture of the SM41-226 (designated SM41-111) at the Grudziądz depot, November 19, 2009. Photo by Sławomir Fedorowicz (from my collection). 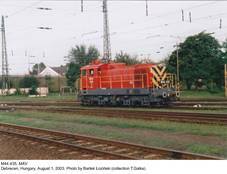 SM41-175 (Ganz-MAVAG 970/1966), photographed at the Zduńska Wola Karsznice depot on October 27, 2003. SM41-227 (fictitious service number SM41-43), photographed at the Kościerzyna railway museum on September 23, 2013. Hungarian M44 522, photographed in Szeged on July 9, 2003. Photo by Bartosz Łoziński (from my collection). 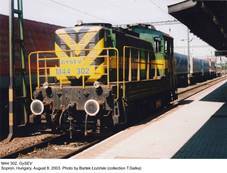 Another Hungarian locomotive: M44 403, Photographed in Budapest on September 22, 2004. Photo by Wojciech Kolondra (from my collection). SM41-164, photographed at the Wrocław Główny station on April 24, 1994. Photo by M.Zaworski (from my collection). SM40-10, Stargard Szczeciński, July 17, 1998. Photo by B.Łoziński (from my collection). By the way: either this description is incorrect or side guard railings have been fitted during service. 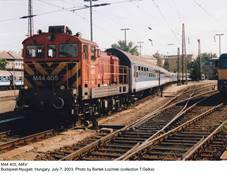 …and M44 405, Budapest, July 7, 2003. All photos by Bartek Łoziński. A railwayman poses on the SM41-263; location and date unknown. Photo from my collection. A farm tractor did not stand a single chance against the SM41-44; location and date unknown. Photo from my collection. SM41-111, photographed in Gardeja on November 10, 1996. Photo by Marek Niemiec (from my collection). Another picture (postcard) from my collection, and SM41-111 again: photo by Paweł Winnicki, location and date unknown. SM40-10, location and date unknown (probably ZNTK Poznań repair works). Photo from my collection. Another photo from my collection: SM41-11, date unknown, probably the same location. It can be argued that decision to withdraw steam locomotives from service with PKP in a relatively short time (however, in effect much longer than previously envisaged...) and replace them with diesels had been based on emotional rather than economic reasons. 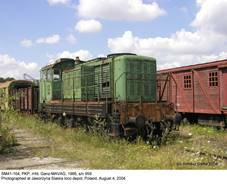 In mid-50s there was almost no experience in Poland with this type of locomotives: only a handful of small switchers were in operation. Moreover, cheap coal was readily available, while almost all petroleum had to be imported. It was decided, however, that development should follow the pattern established in other countries: rapid electrification and introduction of diesel power. 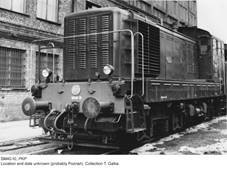 Polish industry was not yet ready to produce an indigenous diesel locomotive: proto­types of rather primitive 300 hp SM30 light switcher (powered with a license-built tank engine) appeared only in 1956. This meant that heavier machines had to be imported and basically only manufacturers from the Eastern Block could be taken into account. 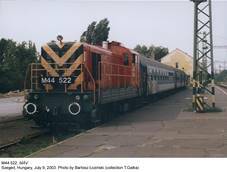 The choice fell on a Hungarian diesel locomotive with factory designation DVM2. 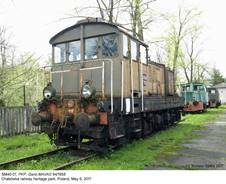 Hungary had much more experience with diesel power; successful railcars being produced from 1928 onwards. After WWII, Ganz works of Budapest continued to develop the well-known Ganz-Jendrassik engine of pre-war design. The V-16 variant of this diesel, rated at 600 hp, was chosen as the prime mover for the DVM2, prototypes of which were built by MÁVAG in 1954 (Ganz and MÁVAG were forced to merge in 1959). 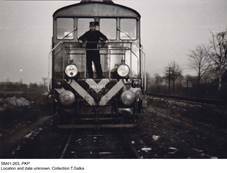 It was a universal machine with electric transmission for switching and light drafts, although its suitability for passenger trains was limited due to lack of car heating equipment. 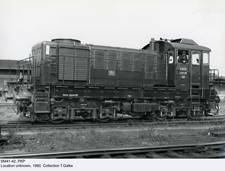 DVM2 was the starting point of the entire family of diesel locomotives with electric transmission that remained in production until 1976. 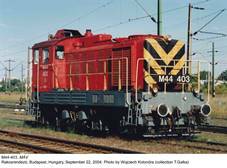 Hungarian state railways (MÁV) designated them M44; according to rosters available at www.railfaneurope.net, 200 were purchased and in January 2005, 51 still remained in the inventory, plus seventeen from 30 locomotives rebuilt and re-designated M44.5. 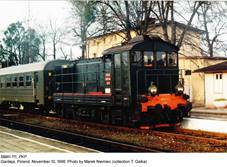 The same source gives 14 machines used with GySEV (Györ-Sopron-Ebenfurth railway) and six similar locomotives built for BHEV (local traffic around Budapest) – class DL XVI. With Hungarian industrial operators, they were designated A25; according to a very comprehensive survey by Ferenc Joo (www.zpok.hu/fjoo, also private communication – thanks, Ferenc), this class numbered 114 units, at least 11 ex-MÁV machines and 6 passing then to MÁV or GySEV (I am not sure whether the above total for MÁV includes these examples). In Hungary these machines were nicknamed ‘Bobo’ (due to their axle arrangement with twin two-axle trucks). Forty MÁV machines were modernized and fitted with new Caterpillar engines and state-of-the art electronic control systems (hence ‘Digital Bobo’); they were re-designated M44.4. GySEV decided to fit new Deutz TBD604BL6 engines (re-classed M44.3). Former Ganz-MÁVAG (now Ganz Transelektro Traction Electrics Ltd.) still offers modernization packages. Many DVM2s and their derivatives were sold abroad. Yugoslavia received probably 105 machines, designated class 641. After disintegration of this country those surviving remained in service only with JŽ (now Železnice Srbije – ZS) company in Serbia and later in Montenegro. 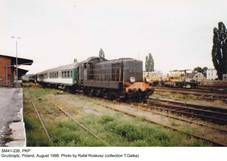 Bulgaria purchased 136 machines: 71 went to the Bulgarian State Railways (BDŽ) as class 51 and 65 to industry (four were later transferred to BDŽ). Most probably all have already been written off (only three remained with BDŽ in 2003). In 1956, one DVM2 underwent service tests in the USSR; results were satisfactory and between 1958 and 1965 Soviets purchased 325 examples, classed VME1 (factory type DVM4). They differed from the basic variant in having lower reduction ratio (73:21) and maximum speed was set at 65 km/h; later variants had slightly more powerful diesels, rated at 640 hp. One machine (VME1-024) was used for experiments with indigenous ac electric transmission. Six examples with up-rated VFE 17/24 diesels (800 hp) and 71:17 reduction ratio, supplied to the USSR in 1963, were classed VME2. Further purchases were abandoned, as six-axle heavier switchers were considered more suitable for Soviet conditions. Most VME1s and VME2s were withdrawn before 1985, but some probably are still in use. Production of DVM2 and its derivatives (DVM4, DVM5, DVM7 and DVM12) totaled 1297 examples; the basic variant was the most numerous one, 926 examples being built (many thanks to Attila Kirchner for details concerning production). First DVM2 was tested by PKP in 1957. 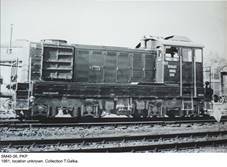 Results were considered satisfactory and ten locomotives were purchased in 1958 (type DVM2-2, MÁVAG 94/1958 through 103/1958) and initially classed LWe58. In 1960, after new designation system had been introduced, they were re-classed SM40. 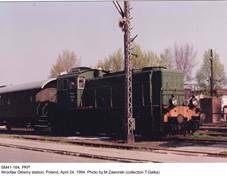 They were based in Kraków (six) and Szczecin (four) and used mainly for switching, replacing old, obsolete steam locomotives used for this purpose. However, Kraków-based engines initially often ran with local trains. Their electro-pneumatic control system proved troublesome and unreliable in service, so next variant for PKP (type DVM2-10) featured several modifications and control system was generally simplified. This version was designated SM41 and 263 examples were purchased for PKP between 1961 and 1968. 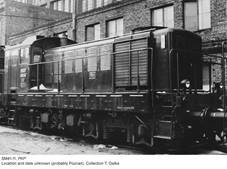 Industrial operators received further 109 (between 1961 and 1971), one of which was later transferred to PKP and given service number SM41-264. 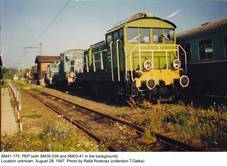 Another one, SM41-1325 (Ganz-MÁVAG 1325/1968) was sold to the military railways; it was scrapped around 2004. SM40s were later modified during overhauls, but their designations remained unchanged. Externally both versions were almost identical, but could be easily distinguished by side guard railings along footplates, which were missing in SM40s. In early 1960s, SM41 was the most important diesel locomotive in PKP service, used for switching, but often hauling local passenger trains (during winter heating cars were necessary). Prototype of its potential replacement, indigenous SM42 from Fablok, appeared only in 1964. 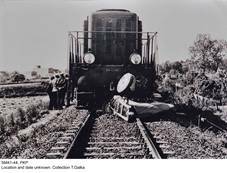 Manufacturing quality of Hungarian locomotives was, however, considered somehow unsatisfactory and initially defects were commonplace. Withdrawal of this class started in mid-1980s, but was accelerated in early 1990s due to overall surplus of switchers. Last SM40 was withdrawn from PKP service in September 1991. Between 1989 and 1993, as many as 174 SM41s were written off. Last example (SM41-226, s/n 1137/1967) was withdrawn in June 2000. 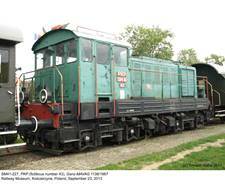 This machine has been preserved at Grudziądz depot, albeit with fictitious service number SM41-111; ‘real’ SM41-111 was in fact the last locomotive of this type to see line service, which took place in November 1996. In 2010 this locomotive was purchased by local authorities, with an intention to use it with tourist trains. Fictitious number was retained. The locomotive was restored to working order, but until today (November 2015), due to various formal and legal obstacles, it has seen no service. 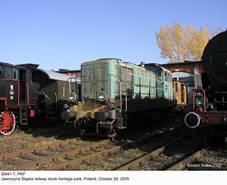 Two SM40s (SM40-01 and SM40-10) and at least seven more SM41s have survived until today in museums and locomotive depots, but none is serviceable. 1) 273 purchased for PKP (10 SM40, 263 SM41 plus one SM41 from industry) and 109 for industrial operators. 2) Some sources give 11 278 mm. 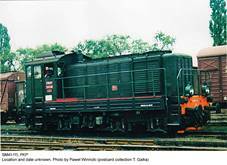 4) SM40: 62 000 kg and 15.5 tonnes, respectively. - Ferenc Jóo and Attila Kirchner (private communications).